At the beginning it was just Consciousness that was luminescent with unmanifested potential energy and residing at resonant state of non‐vibration. This energy was self manifest and was ever-present as Paramaanu or Microbode or Vinporul aka a subatomic or god particle. This is omnipotent, omniscient and omnipresent. If we look at this particle’s characteristics scientifically, it is Eternal (Anaadi), Primordial (Aadi), without any quality (Nirguna), it cannot be reached / grasped by thoughts of mind (Achintya) since thoughts as energy are much more gross than this, it cannot be measured (Aprameya), Luminescent (Jyothi swaroopa), its omnipotence (Ishvara), omnipresence (Vishva) and Omniscience (Sarvajna) is already known. We can observe that all the characteristics of the god particle are attributed to a personality or a state by the founders of religions. Be it Vedic culture, Zoroastrians, Greek or any major culture fire / sun god which represents light is worshiped. In Gayatri mantra you meditate on the supreme light to illuminate you. Vallalar said “Arutperumjyothi, Arutperumjyothi” which means mighty graceful light. 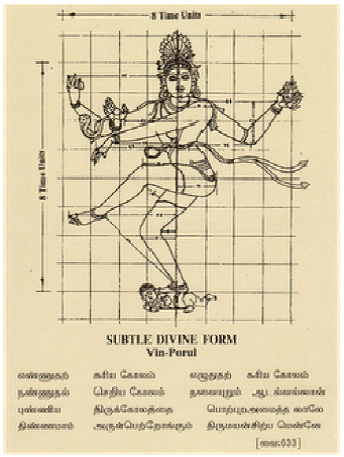 Siddhar Thirumoolar sayss brilliantly that one who realizes that the light (physical light which means the world) merges with light (subtle light), he has realized Siva(Consciousness). So what has happened to the Sabda Brahman (Sound) here? It has merged with the Artha Brahman which is the Light. What can you use to represent this state? Light represents Form and our eyes represent Light / Form. So obviously sound is represented by ears. When sound has merged with light then it means Eyes and ears are merged together. Can you think of anything that represents this state? This concept is captured by representing a Manduka (Frog) or Sarpa (Snake) always. Since for a frog and a snake the ears and eyes are merged. Manduka Upanishad, represents knowledge of this state. And obviously the 8×8 square / cube represent the most subtle energy as an energy grid is called as Manduka Pada / Mandala. The same aspect when it is applied to a gross form / body or a building then it is a 9×9 energy grid and it is called as Paramasyika Mandala. At the gross level the same concept as applied is the WORD where Light (form) and sound and meaning merged into one. This entry was posted in Religion, Science, Spirituality and tagged education, GOD, inspiration, life, philosophy, religion, research, science, spirituality, thoughts by Ganesh. Bookmark the permalink. Is there a difference between the logical mind and the mind? Ta, now I know what those ancients meant.